In 2014, the West African countries of Liberia, Guinea, and Sierra Leone suffered the most severe outbreak of Ebola ever known. By the time the epidemic was contained in 2016, the Center for Disease Control (CDC) estimates there were nearly 29,000 cases resulting in more than 11,000 deaths. During this time, healthcare workers were among the individuals most at risk as they worked to care for those infected with the deadly disease. A report from the World Health Organization (WHO) states that a reported 881 health workers were infected, resulting in 513 reported deaths. All told, it is estimated Liberia lost 8% of its doctors, nurses, and midwives to Ebola; Sierra Leone lost 7%; and Guinea 1%. Devastation of West Africa’s healthcare workforce, in turn, severely impacted healthcare services for the treatment and control of HIV and tuberculosis, resulting in another 10,600 lives lost to those diseases. “The human suffering brought about by this deadly outbreak was unlike anything ever experienced by healthcare workers on such a broad scale,” said Onyema Ogbuagu, assistant professor of infectious diseases at Yale, who is overseeing the university’s effort to improve internal medicine residency training and alleviate the critical doctor shortage resulting from the outbreak. “The dedication that these physicians showed to deliver care to Ebola victims in the face of very challenging circumstances is noteworthy and outright heroic,” said Ogbuagu. In particular, during the outbreak, Ebola claimed the lives of more than 4,800 Liberian citizens with its healthcare workforce community being hit especially hard. The nation was the second hardest hit by the outbreak, emerging from it with the lowest doctor-to-patient ratio in the world. Ogbuagu, who has spent time in Liberia (three times in the past year), says every doctor working there has stories of people they knew who contracted Ebola and died during the outbreak. Led by Yale’s Dr. Asghar Rastegar, professor of medicine and director of the Office of Global Health in the Department of Medicine, Ogbuagu and other Yale School of Medicine faculty partnered with the Liberian government to rebuild a high-quality, resilient, and sustainable healthcare system in that country. They worked closely with the Liberian Health Workforce Program to ensure the nation’s hospitals and medical professionals would be prepared to respond effectively in case another public-health emergency strikes. The effort — supported by grants from the World Bank, the U.S. Health Resources and Services Administration and USAID — focused on strengthening three core areas of the Liberian healthcare system: hospital management, pre-clinical medical education, and postgraduate residency training in internal medicine. Ogbuagu and various Yale colleagues have provided technical consultation to Liberia’s Ministry of Health; the nation’s major teaching hospital, JFK Medical Center; its sole medical school, A.M. Dogliotti College of Medicine; and the Liberia College of Physicians and Surgeons which runs the physician specialty training programs. 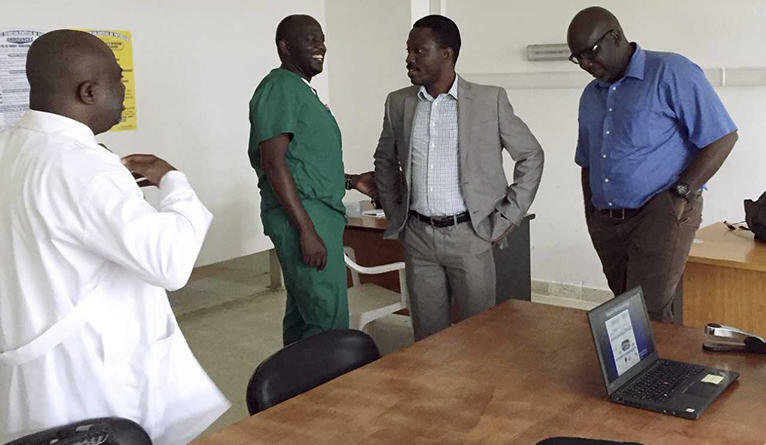 The Yale team also has recruited faculty from the sub-Saharan region and the United States to enhance the quality of pre-clinical education and postgraduate training at Liberia’s medical schools. 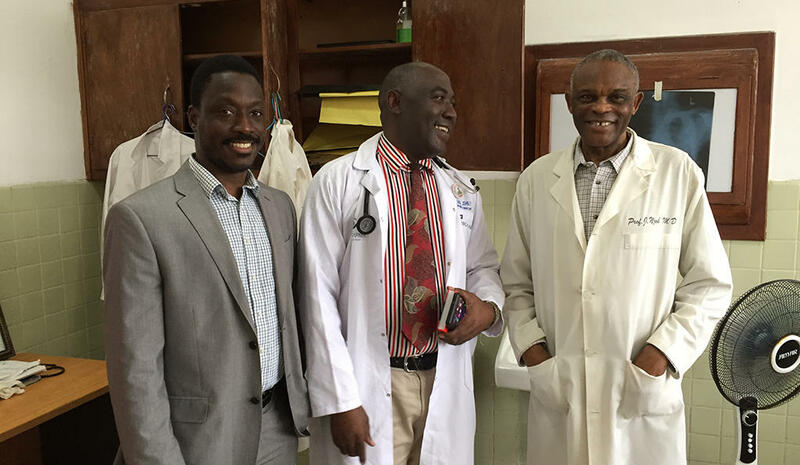 Since 2016, Ogbuagu and his colleagues have worked to develop the clinical, teaching, and research skills of Liberian medical faculty, and to create a strong cadre of specialists to meet patients’ needs at every level of the country’s healthcare system, from district health clinics to the major hospitals. “We are seeking to improve the quality of patient care through mentorship, innovative teaching approaches, and improved training programs, as well as by developing evidence-based clinical care guidelines and instilling a culture of continuous quality improvement,” Ogbuagu said. In the current academic year, Yale has recruited three physician-educator faculty members to teach in Liberia for 12 months. Six subspecialists will each spend two months teaching in gastroenterology, cardiology, oncology, pulmonology, lab medicine, and infectious diseases. A fellowship training program in infectious diseases, funded by USAID, will be initiated in July 2018. Dr. Kristina Talbert-Slagle, Yale assistant professor of general internal medicine, oversees the project’s hospital management and preclinical education components. She said that the project’s hospital-management component has two overarching goals: First, to develop an applied mentoring program to build management and leadership capacity in county health teams, which are responsible for coordinating healthcare on the local level, and at the hospitals. Second, the project aims to develop a certificate-level training program in health management for existing Liberian health managers working in hospitals and health facilities, in partnership with Liberia’s Ministry of Health and a local training institution. 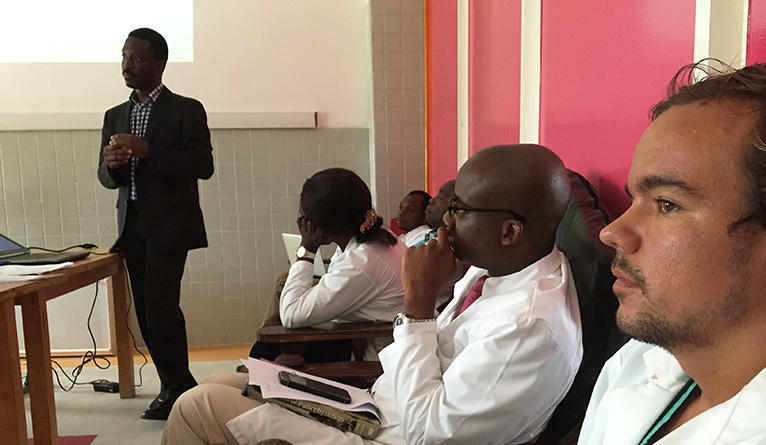 As part of the effort to strengthen the nation’s pre-clinical education — the portion of medical training that focuses on instruction in basic sciences and precedes involvement with patients — Yale postdoctoral teaching associates are serving as pre-clinical faculty members at Liberia’s A.M. Dogliotti College of Medicine. The postdoctoral associates are working with colleagues at Yale and their Liberian counterparts to deliver a context-oriented curriculum, mentor junior faculty and teaching apprentices, and develop interdepartmental initiatives to enhance the overall quality of the medical school’s education program. Additionally, Yale has recruited three faculty members to teach in the pre-clinical program in the current academic year in neuroscience, pharmacology, and community medicine/public health. Yale is collaborating on aspects of the project with several U.S. medical schools and teaching hospitals, including Boston Children’s Hospital, New York’s Mount Sinai, Brigham and Women’s Hospital, and New York University. The members of the Yale team say they hope that sustainable improvements in the quality of medical education and training resulting from its initiatives in Liberia will foster a more robust and resilient healthcare workforce and system that is equipped to address future public health threats or emergencies. To learn more about Yale’s efforts in this area, or to contribute to the work under way contact Laura Crawford, Yale Office of Global Health at laura.crawford@yale.edu.